The covers are properly tailored to the Navara’s seats - they don't fit any other model. The covers have separate head-rest covers from the main seat covers and have elasticated hems around the seat squab. The back of the front seats are fully covered. To keep the covers securely in position there are elasticated straps with convenient click-shut buckles underneath. There are also openings for the side-airbags. The rear covers are two piece covers to allow the 60 / 40 split seats to function normally and to move independently. There is a zip located in the larger rear seat cover which sits behind the middle 3-point seat belt to allow it to function as intended. There are also elasticated straps with click-shut buckles serving the seat squab and also behind the seat back to keep the cover properly in place so they are easy to fit and remove and they fit extremely well. 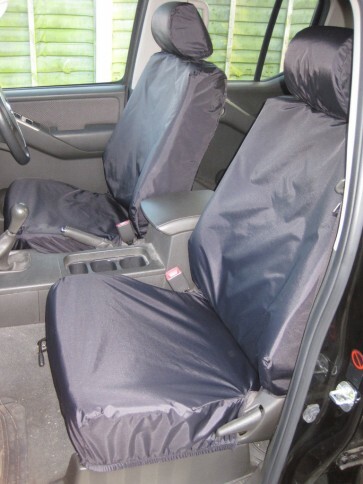 Manufactured by Turtle Covers in their UK workshop, these covers are made from 100% waterproof polyurethane (PU) coated 300 denier polyester - providing both quality and comfort - which not only saves your car seats from wear and tear but also from oil, grease, drink and food stains, dog hairs and general grime.